Phoofie has always been odd. He made it a personal mission to clean pack members over the years if they were anywhere receptive or patient about humouring this quirk. When Nemo was very young, Phoofie attempted to clean the big guy’s face, and whether the fluffster’s rough tongue rubbed wrong on My Dog’s toes, nose, ears or his eyes is anyone’s guess what the offense was. Anytime the cat walked anywhere near his face or feet, Nemo would growl at him, and during the last few months of his increasing canine dementia, even snapped at him. This freaked the poor cat out and he’d retreat under a chair or table a safe distance away while Nemo would put his head back down and let out an occasional low growl as if to say, “I know you’re sitting there looking at me. Don’t even think about it.” But Phoofie never gets insulted. Since Nemo’s passing, you’d think the last one to care would be the elderly cat who got growled at, run over by 130 lbs. of excited to go out and chase squirrels, or who often got quickly scooped up and off a comfy dog spot when the dog wanted it and a human had to intervene before fur flew. Yet animals grieve for the loss of their family members in their own way. 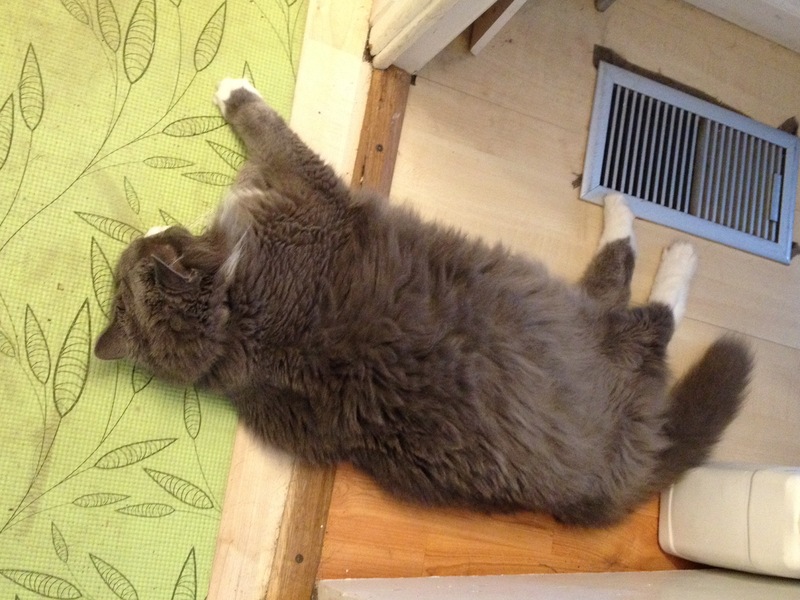 Phoofie has been sleeping on air conditioning floor vents, especially on The Fave one, and on all of Nemo’s rugs and throws. He was the only one who noticed at all that My Dog was missing. Sparky really hasn’t noticed or acted outside of his weird zone. Maybe I’m overly sensitive to their behavior, but I’m convinced from many years of observing animal interaction inside a family setting: Phoofie is definitely missing My Nemo.